It’s your turn to make the rules. 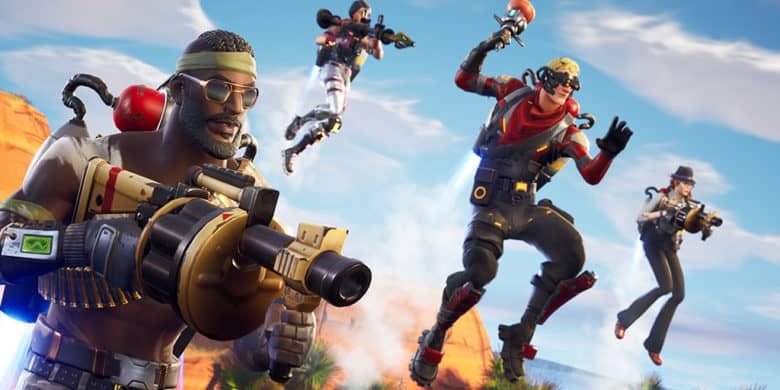 Just days after rolling out its latest Fortnite update, Epic Games has issued its complete list of challenges for season five, week five. There are seven to complete altogether for a total of 50 Battle Stars. Three of them are available to all, while the other four require a Battle Pass. Here’s our guide to finishing each one! Collecting Battle Stars is the most effective way to level up your Battle Pass and unlock all the awesome rewards on offer. You’ll find new challenges in-game every day, but they’ll reward you with just five stars. Complete all the weekly challenges and you’ll get 50. You’ll find a whole bunch of chests in Junk Junction, and all you have to do to complete this challenge is open seven of them. But don’t assume it will be easy. Although Junk Junction is normally a ghost town, it will be teaming with people this week as everyone rushes to complete this challenge. The map below, courtesy of Dexerto, shows you where all the chests are located, which will make this a little easier. 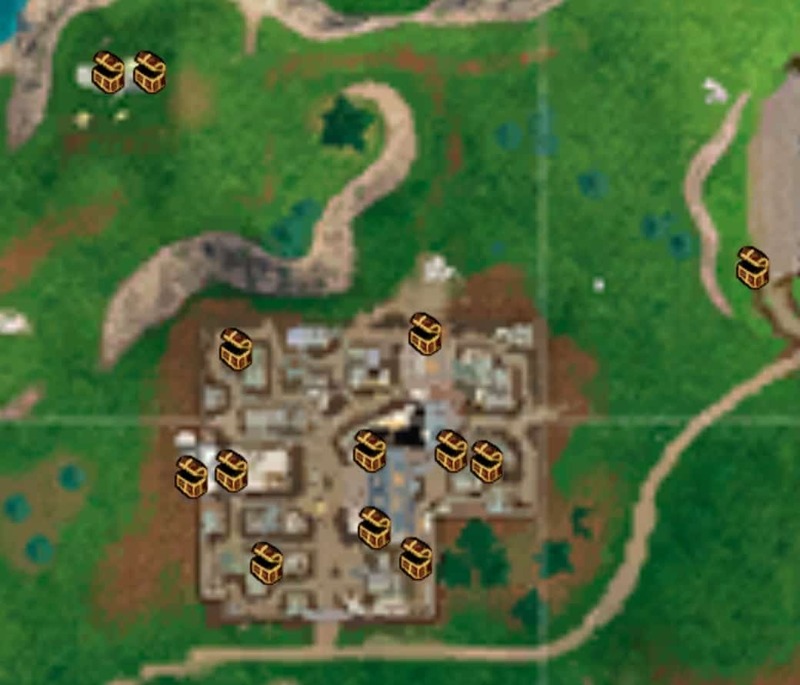 Here’s where you’ll find all the chests in Junk Junction. If you do find this challenge difficult because you keep getting eliminated, wait a few days until Junk Junction is quieter. And remember, you don’t have to open all seven chests in one match, so you can return as much as you need to. Rifts are located all around the Battle Royale map in season five, and they’re a great way to get around. All you need to do is locate three and use them. 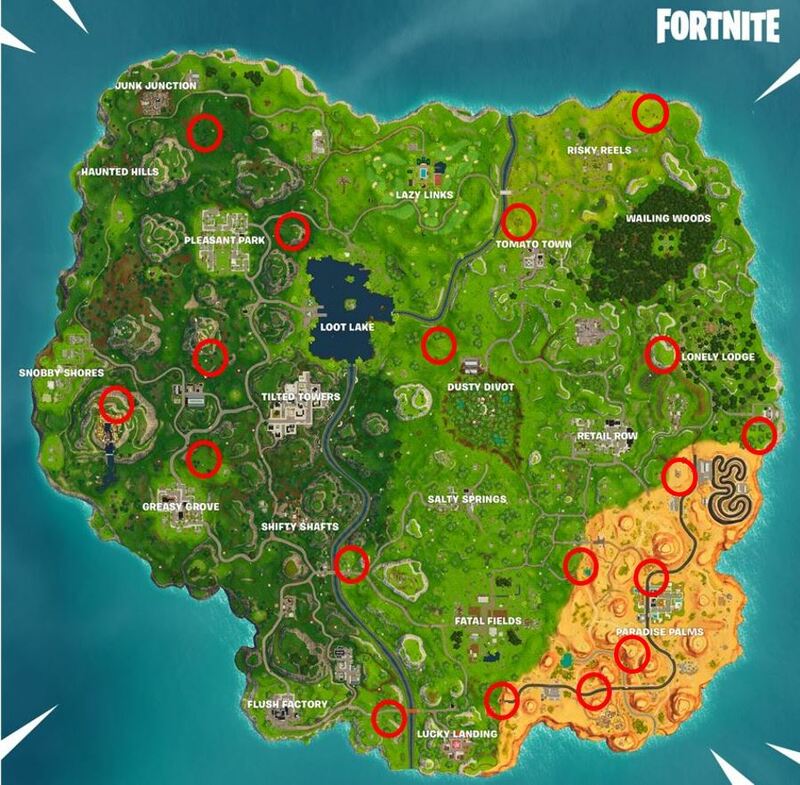 The map below, courtesy of Fortnite Insider, shows you where you need to go. Here’s where you’ll find rifts in Battle Royale. Eliminating opponents is always tricky — especially if you’re new to the game — and getting three kills in one match is even harder. But we have some tips you can follow if you’re struggling. Try to land in an area that you know will be busy, like Tilted Towers, Paradise Palms, or Junk Junction while this week’s challenges are fresh. Grab a gun as quickly as possible (and shields if you can) and be aware of where your opponents are around you. Find a good spot to hide, like inside a popular building, and take down your opponents as they rush in. If you can, build some cover to ensure you always have the advantage in a gunfight, and use well-placed traps to make enemies weaker before they get to you. If this doesn’t work, try teaming up with others in a duo or squad match and you might find it a little easier with some backup. Alternatively, jump into more chaotic game modes like 50v50, where there are plenty of opponents you can pick off from a distance. Another one of this week’s challenges — if you have the Battle Pass — is to eliminate three opponents in Shifty Shafts. You might choose to kill two birds with one stone, then, by completing both challenges at the same time. Using clingers, stink bombs, and grenades can be difficult, but remember that you don’t need to get kills with this challenge — you just need to deal damage. And you don’t have to do it all in one match. Pick up these items when you come across them and throw them when you have a good opportunity. They’re great for lobbing into bases. Use them wisely and you should be able to rack up 500 damage in no time. Again, if you struggle, try a team-based game mode where you’ll have some backup and there are more opponents to aim for. Just like the basketball challenge a couple of weeks ago, the golf ball challenge is straightforward. You simply need to use the golf emote unlocked at tier 27 to hit a ball from a tee onto the green. All the tees are found around Lazy Links, so you should be able to do this challenge in one match. But bear in mind that your ball needs to reach the green — not the fairway — so you’ll need to be accurate. If you ball doesn’t land in or close to the hole, it won’t count. These challenges are the best because they award you with 10 Battle Stars for very little effort. You don’t even need to visit Snobby Shores to check the treasure map first. Simply visit the hidden treasure location in Haunted Hills and collect your stars. 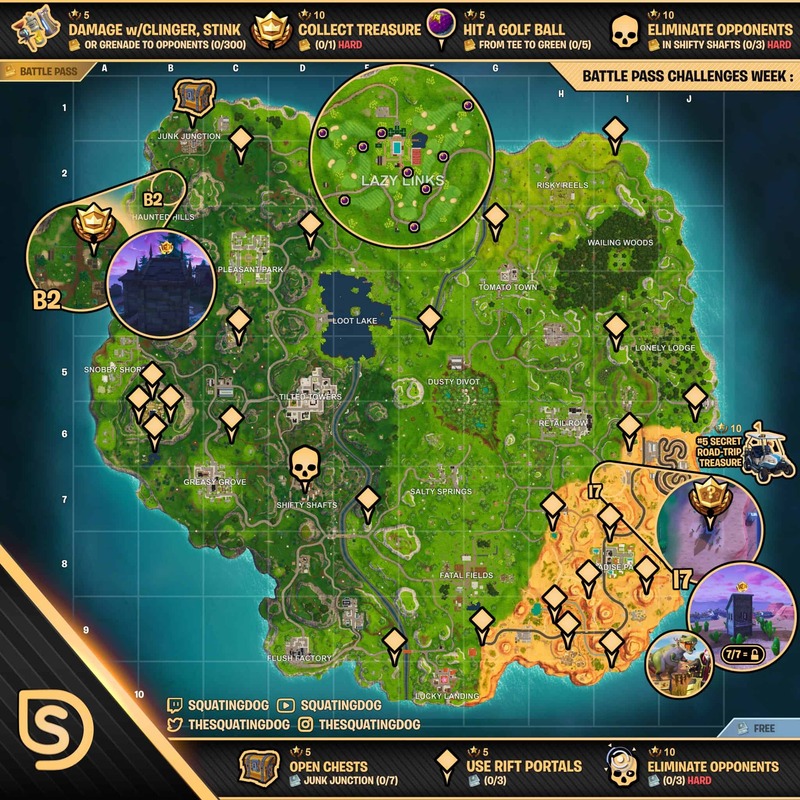 The map below, courtesy of @TheSquatingDog, shows you exactly where to land (see square B2). You might want to pick up a weapon first in case other people land in Haunted Hills with you (it will be busy this week). See B2. Here’s where you’ll find the hidden Battle Stars. This challenge is just like the one above — to eliminate three opponents — except you need to get all three kills in Shifty Shafts. Again, it’s best to go for this challenge first and you might end up completing both at the same time. Unlike the other challenge, though, you don’t have to get all three kills in one match. So, if you pick up one and get eliminated, you can return to Shifty later for the other two. We also have challenge guides for week one, two, three, and four if you need them. And if you’re not already playing Fortnite on iOS, you can download it from the App Store now. An Android beta is also available, but only for Samsung Galaxy devices for now.